The Hilton Omaha is the official Strategic Space Symposium hotel, located adjacent to the Qwest Center Omaha. The hotel provides complimentary airport shuttle service to/from the Hilton Omaha. Two night deposit is required by hotel. Call or visit Web site for rate. *Please contact the hotel to request a room at the per diem rate. 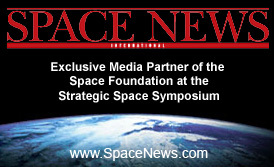 Please mention the Space Foundation/Strategic Space Symposium room block. A valid government or military ID is required at check-in.